[v1.8.12] SecurityCraft~ Security cameras, Retinal scanners, and more! SecurityCraft is partnered with Nodecraft! Join the official SecurityCraft server here! Want your very own Minecraft server? Use the promo code "SecurityCraft" or use this referral link to get 30% off your first month's payment! There will not be another update which adds major features, however, bugfixes and tweaks will still continue. And before you ask, no, SecurityCraft isn't being discontinued! Check out this awesome mod spotlight by Rayne! SecurityCraft adds a lot of new content to secure your house with. Ever wanted to protect your home against pesky creepers or annoying griefers? Now you can! Descriptions of all the features in SecurityCraft v1.8.0 or later can be found in the in-game item called the "SecurityCraft manual". 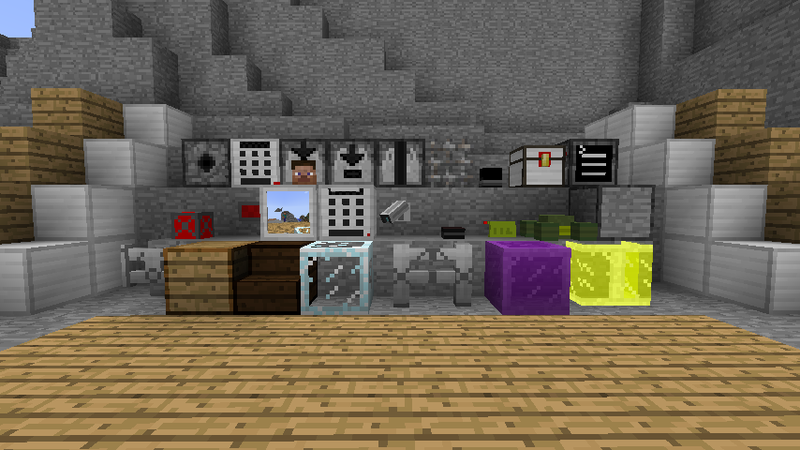 It gives the descriptions and recipes of all the blocks/items in the mod. You get can it in Creative mode or by typing "/sc help". Using the "/sc" command, you are able to report bugs directly to my EsperNet IRC channel. Type "/sc connect" to connect to IRC (the name you will use in IRC will be "SCUser_" + *your username*. Then type "/sc bug ". Once you do that, the bug will be posted in my channel, #GeforceMods. Also, if you need to contact me directly, use the '/sc contact ' command. My replies will appear directly in the Minecraft chat window! If you want to disconnect from IRC, type "/sc disconnect". You must have an internet connection to do this. As stated in the above spoiler, all the recipes for blocks/items in SecurityCraft v1.8.0 or later can be found in-game, in the "SecurityCraft manual" item, which you can get in Creative mode or by typing "/sc help". Note: As with all new CurseForge downloads, they have to be approved by a moderator. If a new version was announced, but it doesn't let you download the file, check back in a few hours. Just place the downloaded file into your .minecraft/mods folder with Forge installed. [1.8] SecurityCraft v1.7.2: Click me! [1.7.10] SecurityCraft v1.7.2: Click me! [1.8] SecurityCraft v1.7.1: Click me! [1.7.10] SecurityCraft v1.7.1: Click me! [1.8] SecurityCraft v1.7.0: Click me! [1.7.10] SecurityCraft v1.7.0: Click me! [1.7.10] SecurityCraft v1.6.1: Click me! [1.7.2] SecurityCraft v1.6.1: Click me! [1.7.10] SecurityCraft v1.6.0: Click me! [1.7.2] SecurityCraft v1.6.0: Click me! [1.6.4] SecurityCraft v1.5pre: Click me! [1.6.2] SecurityCraft v1.1: Click me! Question: Can i use this mod in my modpack? Answer: Sure, as long as credit is given! Question: Can you port this mod to Minecraft 1.x.x? Answer: I will probably only be porting this mod to versions 1.6.2/4, 1.7.2/4, and future versions. Question: My game crashed! Your mod doesnt work! Answer: I need the crashlog. I cannot help you without it. Post your crashlog here, or on my forums, and ill get back with you. Question: Why is there no recipes for keycard lv2 and 3? Answer: As of SC v1.5, there is crafting recipe, but you have to enable them through the SecurityCraft configuration file. Answer: Update Forge to v11.14.1.1338+. Link to that version found here. Follow us @I_Mod_Minecraft and @bl4ckscor3 on Twitter. We post updates and announcements related to SecurityCraft and other mods, plus other ramblings. Suggestions? Want to see how the mod's development is coming along? Check out SecurityCraft's Trello board, found here! Found a bug or experienced a crash? Let us know by using this GoogleDocs form. SecurityCraft's source code can be found on GitHub! Thanks guys! Be sure to leave suggestions if you have any! Nice. You can accomplish some of this via ComputerCraft password lock doors, but I'm sure you'll add more to this mod. Holy mackarel i have been looking for this! Finally someone is making it, keep on working i wont bug you. Nah, no problem, i love when people get excited about my mods . Anyway, the keypads done, working on the laser tripwire now. Hey, really looking good so far. Retinal scanner: Will have a GUI that checks your characters username/skin and puts out a redstone signal if it matches with one on file. Make the GUI so that only the one who built the Scanner can open it. and then you get a List of the Names that are allowd to trigger it. Where %player% is put the Name of the Player. Hi your mod looks amazing and can i make a mod review(of coarse like beta or i can be the first person to review.) and please i really need video ideas i do quality videos and well i like your mod. but remember you need to put it on the main thread of the mod. Here is one of my videos i do much better when actually playing mods. Sounds lovely. I hope it'll get into FTB Unleashed. Holy mackarel­ i have been looking for this! The SecurityCraft pre-release is out! Check out the main post for all the info + download link! Thats actually a really good idea, Ill try it now! Sure, ill love a mod spotlight! And ill put it on the main thread . Thanks! Ill see if i get a camera in the mod ! Hey, just downloaded it, but no idea how to craft or get any of the blocks... any help? Hey, im sorry, i forgot to put it in the thread! Use creative mode to get the blocks right now (its in the redstone tab). The recipes will be added in the next update, along with bugfixes :). Thanks for trying my mod! Hey, im sorry, i forgot to put it in the thread! Use creative mode to get the blocks right now (its in the redstone tab). The recipes will be added in the next update, along with bugfixes . Thanks for trying my mod! cheers, and I think my problem is never using forge before and not knowing where to place the mod. And don't worry, I want to start doing mod spotlights, and this looks like a simple but fun mod. Heres a tutorial of how to install Forge for 1.6.2 :). It looks good. Why not a feet scanner. Same as Retina scanner, but you walk on it and if it's a player/skin, then it emits a redstone signal. We all hate wolves. Ocelots are better than wolves. A new feature is in the v1.0 full release coming this afternoon, the mine! Walk on top it, and a nice little surprise greets you :Lava:. A new feature is in the v1.0 full release coming this afternoon, the mine! Walk on top it, and a nice little surprise greets you . Of course! The glass texture is just a placeholder for now. v1.1 will definitely have a nice looking laser texture :).